Hillary Clinton blames her 2016 Democratic primary opponent, Sen. Bernie Sanders (I., Vt.), for "paving the way" for President Donald Trump's "Crooked Hillary" campaign in her new book What Happened. 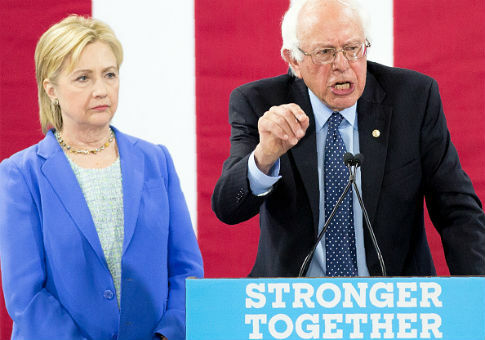 Clinton supporter Tom Watson on Monday tweeted a page from the forthcoming book, set to be released on Sept. 12, in which Clinton questions why Sanders has not joined the Democratic Party and argues Sanders has divided the party to which she is loyal. She touts her progressive policies as comparable to those of Sanders, accuses him of impugning her character, and defines many of his supporters' actions as "sexist." "Because we agreed on so much, Bernie couldn't make an argument against me in this area on policy, so he had to resort to innuendo and impugning my character," Clinton writes. "Some of his supporters, the so-called Bernie Bros, took to harassing my supporters online. It got ugly and more than a little sexist." "When I finally challenged Bernie during a debate to name a single time I changed a position or a vote because of a financial contribution, he couldn't come up with anything," Clinton adds. "Nonetheless, his attacks caused lasting damage, making it harder to unify progressives in the general election and paving the way for Trump's ‘Crooked Hillary' campaign." "I don't know if that bothered Bernie or not," she writes. Trump frequently referred to Clinton as "Crooked Hillary" during the 2016 presidential campaign, portraying her as dishonest and corrupt. Clinton granted that Sanders campaigned with her in the general election but said he still disrupted the Democratic Party she was set to lead. "He certainly shared my horror at the thought of Donald Trump becoming president, and I appreciated that he campaigned for me in the general election," she says. "But he isn't a Democrat—that's not a smear, that's what he says. He didn't get into the race to make sure a Democrat won the White House, he got in to disrupt the Democratic Party." "He was right that Democrats needed to strengthen our focus on working families and that there's always a danger of spending too much time courting donors because of our insane campaign finance system," she writes of Sanders. "He also engaged a lot of young people in the political process, which is extremely important. But I think he was fundamentally wrong about the Democratic Party." In her book, Clinton praises Democrats for accomplishments ranging from Social Security to Obamacare. Then she says she wished Sanders also had pride in Democratic politics. "I am proud to be a Democrat and I wish Bernie were, too," she writes. During her campaign, Clinton decried the Supreme Court's Citizens United decision that invalidated some restrictions on campaign spending as undue limits on the First Amendment rights of corporations and other entities, while she still accepted large donations from corporations and political action committees that helped her defeat Sanders. The Vermont senator targeted Clinton for being beholden to Wall Street donors while touting his small donations from individual supporters. "This is the issue of American politics today: Do we have a government that represents all of us or just the one percent?" Sanders said on CNN during their primary battle in April. "You're not going to have a government that represents all of us, so long as you have candidates like Secretary Clinton being dependent on big money interests." Sanders also cited legislation that Clinton voted for after taking "contributions from Wall Street," but said he could not know for sure if the donations affected her vote. Sanders' campaign released various press releases about Clinton's ties to Wall Street, and her resultant lack of "credibility." In another page from What Happened posted by a Clinton supporter, she writes that Sanders and his supporters unfairly attacked her for not sufficiently supporting government programs. To illustrate her point, Clinton uses a post on social media about a hypothetical program to give Americans ponies. In the hypothetical situation, Clinton stands up for fiscal responsibility while Sanders calls for free ponies, and other people gang up on her for hating ponies. This entry was posted in Politics and tagged 2016 Election, Bernie Sanders, Donald Trump, Hillary Clinton. Bookmark the permalink.